The Art Fairs are over for now. The gallerists have packed up after reportedly racking in big sales; many have moved onto other fairs somewhere else. Most will reconvene in Basel in June, and the cycle will begin anew in September. I’ve learned to look a little harder at art fairs, using them as essential Band-Aids when I can’t get to other scenes around the world. In Berlin a couple of weeks ago, however, when the subject of art fairs came up, more than a few dealers said to me that many European artists prefer the fairs to gallery shows. They explained that although there are many great galleries in Berlin, they’re poorly attended. (I’ve heard the same about L.A.) Art fairs afford more eyes on the artist’s work. This breaks my heart a little, but it does mean that art fairs are with us for the foreseeable future, and I made it my business to go to two of them this week. The Outsider Art Fair provided the biggest new discovery of the week. In a magical booth organized by gallerist Chris Byrne and Marquand Books, I saw the prescient drawings of Susan Te Kahurangi King, who does not speak. Born in New Zealand in the early 1950s, King stopped speaking at around age 4 but drew prolifically through her 30s. Then she suddenly stopped drawing as well —only to pick it up again, more or less where she left off, almost 20 years later, in 2008. It is often said of so-called outsider art that it does not change, grow, or develop. Each of King’s drawings — they are made with graphite, colored pencil, crayon, ink, or various types of pens, sometimes on both sides of the paper — explore line, space, shape, surface, composition, color, light, line, density, and touch in different ways. The 20 or so works at the fair were a sampling made between 1958 and 1963. 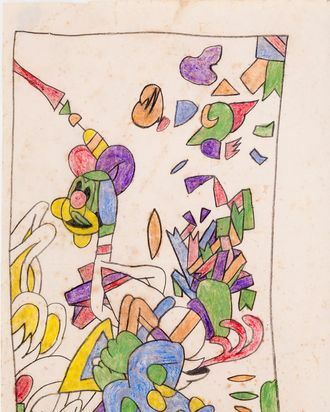 Included are strange abstract combinations or knitted-together landscapes of cartoon parts, notably Donald Duck, arranged in ways that echo Willem de Kooning, Jim Nutt’s meticulous piecing together of body parts and distortion, Roy Lichtenstein’s stylized cartooning, and Carroll Dunham’s deft space and line. Much of her work could hold a museum wall next to these artists’ work. Enticingly and maybe scarily, none of the work has yet been sold; all of it is being kept together for now. One can only hope that some museum will be able to forgo buying two or three paintings by twentysomething phenoms and use the money to save this work from being scattered and a possibly great talent from being fully appreciated. Going to Frieze makes me love being almost away from New York, on an island that — with its scents of waste and brackish water — can conjure up Venice. All these impressions were amplified by a beautiful half-hour rowboat excursion I took on the East River, just a few miles north of where Walt Whitman began Crossing Brooklyn Ferry with the line “Riptide below me.” The trip was the work of one of New York’s better underknown artists, Marie Lorenz, and was part of the outdoor program organized by Cecilia Alemani, the outstanding curator of the High Line. For the past few years, Lorenz has taken the role of a sort of gypsy pirate, going alone or with passengers to navigate the backwaters, secret bays, abandoned islands, and other natural urban spaces on the edge of the city. At Frieze, on my way out of the Fair, I signed up. 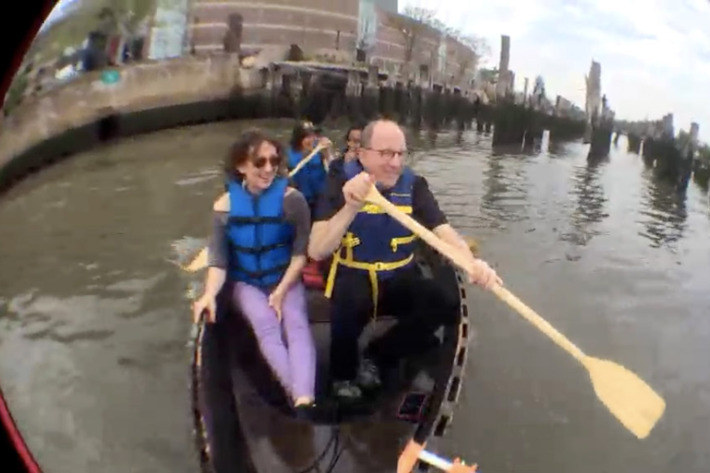 After signing a paper saying I wouldn’t sue if I drowned, I donned a too-tight life jacket and, with two artist-passengers, was taken onto the river by Lorenz. As soon as we launched, my blood pressure dropped, my nostrils drank in the smells, my body reveled in the weird ozone charge of being on water; the sonic landscape changed. As the city faded into backdrop, my perspective of space changed dramatically. We were only a foot or so above the rippling river. It was like a super-slow-motion bicycle ride, with different kinetic effort and without land. My body has never felt this way in New York. I was ecstatic and at peace, hyped up and antsy. Usually Lorenz treats passengers to extraordinary water locales, looping around Rikers Island, JFK, La Guardia, and other places. This time, however, with me being an art critic on deadline, we merely paddled across the river to a derelict pier, rowing between great rotting logs still stuck in the silt.